Unless you stop to really think about it, it’s easy to overlook the number of times the subject of alcohol comes up. From after work drinks to wining and dining a date to rec sports being referred to as ‘beer leagues,’ alcohol has a hold on Canadian culture. The popular culture we consume can also be heavy on references to alcohol – one of the most popular sitcoms of the 20th century was set in bar after all. The popularity of alcohol has even made it a political issue as Andrew Scheer has talked about alcohol taxes on multiple occasions and Doug Ford made $1 beer part of his campaign for premier of Ontario last spring. Despite its celebrated place in the culture, alcohol can be dangerous. The Canadian Institute for Health Information (CIHI) concluded that in 2015-2016, 77,000 hospital admissions were caused by alcohol. To put that in context, heart attacks led to 75,000 admissions. That same report estimated that cost-related harm costs Canadians $14.6 billion a year, including $7.1 billion in lost productivity. Globally, the World Health Organization found that 3 million people died due to drinking too much alcohol in 2016. While a lot of people point to excessive drinking as the primary cause, there are an increasing number of studies showing that even a moderate amount of alcohol consumption is dangerous. 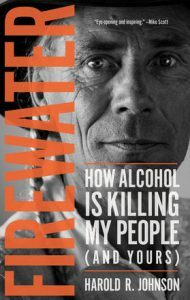 In his new book Firewater: How Alcohol is Killing my People (And Yours), Harold Johnson explores alcohol’s social, economic, and social harm. As a Crown Prosecutor in Saskatchewan, Johnson saw first-hand how alcohol can cause damage to families and communities. In his analysis, he looks at alcohol’s history, its myths, and its impact on Indigenous peoples. In confronting stereotypes and challenging alcohol’s social and economic power, Johnson has written a provocative yet engaging book that forces the reader to re-examine their personal relationship with alcohol. In this episode of the History Slam, I talk with Harold Johnson about the book. We talk about his motivation for writing the book, the “drunken Indian” stereotype, and how the criminal justice system deals with alcoholism. We also talk about trauma in Indigenous communities, reducing alcohol-related deaths, and how addressing these issues requires a communal approach.